1877. The camp of Deadwood in the Black Hills is gaining respectability as the gold rush continues. It has a mayor and a sheriff, and the neighbouring territory of Dakota is expressing interest in annexing the nascent town. The second season of Deadwood is a partially successful extension of the themes of the first season. Order has arisen out of chaos, a new government and law for the town has been formed and people are starting to organise themselves. Deadwood is still a dangerous place - life remains cheap for many - but civilisation is coming. Against this backdrop Al Swearengen is still running shady deals but he has now become involved in political intrigue as he tries to get the best deal possible for the town. Sheriff Seth Bullock's interest in law and order is put aside as he tries to get to know the family he has inherited from his brother, whilst Joanie Stubbs's attempts to go solo and open her own whorehouse end in tragedy. There's a wider variety of storylines and characters in the second season, but they don't cohere as perfectly as they did in the first. The core problem is the essentiality of Ian McShane's presence as Al Swearengen to the success of the show. A curious decision was made to spend about three episodes on Swearengen being indisposed on account of kidney stones, meaning that for a quarter of the season its main protag/antagonist is all but absent, only appearing to pee some blood on the floor. Interesting for its attention to period detail (medicine in the 1870s was terrifyingly primitive), but hardly dramatically compelling. In McShane's absence, some of the thinness of the other character arcs becomes more apparent. Alma Garrett spends a dozen episodes sitting in her rooms not doing very much. Seth Bullock spends most of the season agonising over what to do about his relationship with his inherited wife and stepson (to the point of completely missing a prostitute-murdering killer being loose in the town). It's notable that the second season of Deadwood springs back to life when Swearengen returns to the front line, influencing an important part of history (Deadwood's acceptance into the USA and what territory it will join) from behind his office desk, negotiating deals with hugely important businessmen George Hearst and sorting out an internecine conflict within the Chinese community. Most of HBO's other classic shows succeed with broad ensemble casts, with no central role to hang the storyline on (The Wire, for example, had an entire year in which Dominic West's McNulty barely appeared and it was arguably the best season), but Deadwood falters in Swearengen's absence. That said, even a slightly disappointing season of Deadwood remains great television. As with the first season, the writing, characterisation and attention to detail are all superb. The dialogue is often a joy to listen to, and the show's morbid sense of humour results in laugh-out-loud moments. Alma's indecision over her future prospects is presented sympathetically, but with a true-to-the-period emphasis on realism over sentimentality. Bullock goes through a similar process. Both storylines are drawn out much too long, but are nevertheless explored well. More successful is the way the show presents Cy Tolliver as a man with the veneer of civilisation and decency, but with a seething, frustrated anger not far below the surface. 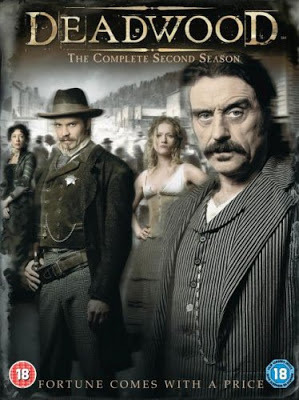 The second season of Deadwood (****) remains compelling viewing, but definitely falters compared to the first year. The pacing feels sluggish at times and the back-room dealings over the camp's future feels like set-up more than the main course. The writing and performances remain exemplary and the thematic developments are fascinating, which help make up for the shortcomings. The series is available now in the UK (DVD only, so far) and USA (DVD, Blu-Ray). Locke and Jean barely escaped with their lives from what should have been the greatest heist of their career, in the port city of Tal Verrar. Now they head north, looking for sanctuary and an alchemist who can cure the poison that is slowly killing Locke. 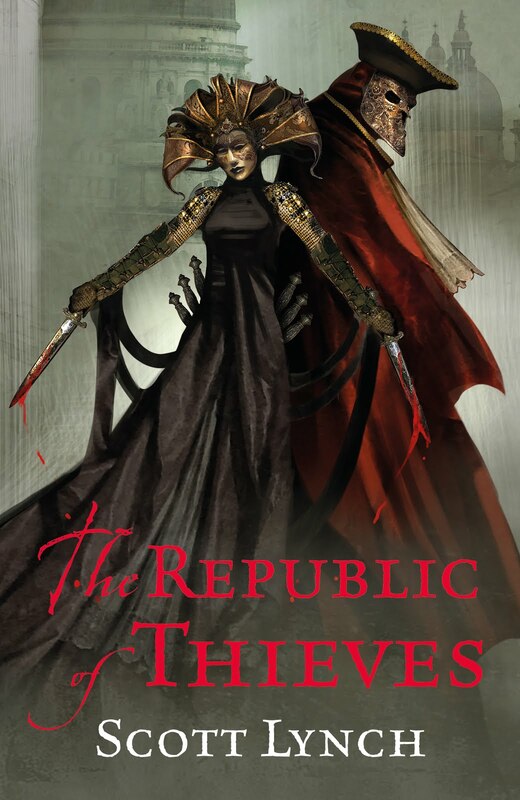 They find neither, but with their luck, money and hope exhausted, they receive an offer from a power that has never had their best interests at heart: The Bondsmagi of Karthain. The Republic of Thieves will be published by Gollancz in the UK on 10 October 2013 and Del Rey in the USA on 8 October. It should be noted that the UK hardcover is currently about half-price as a pre-order on Amazon.co.uk. I am already planning to acquire an advance copy by putting together of team of like-minded bloggers with complimentary skill-sets to raid Gollancz HQ in a manner Locke would be proud of. Unfortunately, Gollancz have assembled their security team from the cream of SFF villains and entities, meaning that the last obstacle to getting hold of the manuscript is defeating the Shrike. 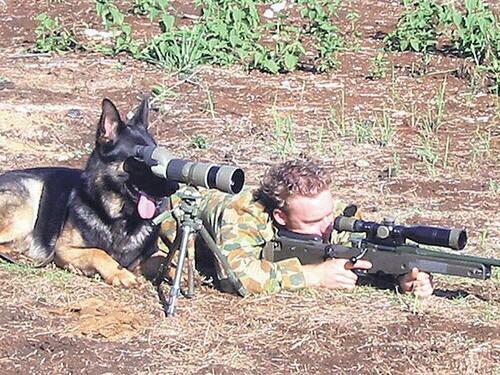 This may not go well. 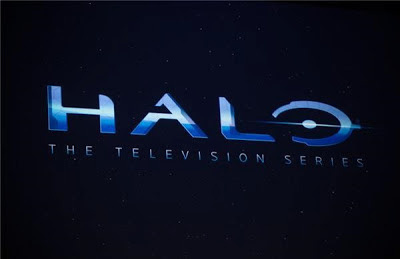 During the launch announcement of Microsoft's new console, the controversially-named X-Box One, it was casually dropped in that Steven Spielberg will be making a live-action TV series based on the Halo videogame series. Almost no other information was revealed, except that the series will be a premium-content show developed as an original series for the X-Box One's TV portal (i.e. there won't necessarily be a traditional or cable network involved), which may also be accessible from the X-Box 360's Gold Live service. Further information - if there's going to be a pilot or a 13-part series or possible airing dates or casting information, or even when it'll be set and what characters will be involved - has not been revealed, though I expect more to be revealed in the next few days. 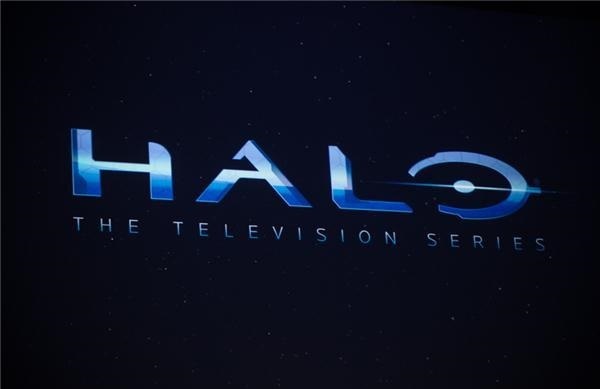 Presumably this means that the long-planned Halo movie (at one point to be written by Game of Thrones showrunner D.B. Weiss, directed by District 13 director Neill Blomkamp and produced by Peter Jackson) is on hold pending how the show turns out. There have been four games in the core series, comprising a completed trilogy (Halo: Combat Evolved, Halo 2 and Halo 3) and the start of a second trilogy (the unpredictably-titled Halo 4). Halo 5 is currently in-development for the X-Box One. There has also been a prequel game, Halo: Reach, a self-contained expansion to Halo 3 called Halo 3: ODST, and a spin-off real-time strategy game, Halo Wars. The games begin in the year 2552, when humanity is at war with a hostile alien race, the Covenant. During a battle between a human ship and a Covenant vessel, both encounter a massive ring-shaped structure in space, ten thousand miles wide. The human vessel crashes on the surface and one of the few survivors, a Spartan elite trooper known only by his rank, Master Chief, has to fight through the Covenant forces to discover the structure's secret: it is home to a rapacious, hostile race known as the Flood which will overwhelm and destroy the entire galaxy if left unchecked. Later games reveal that there are multiple Halo rings and their true purpose is to keep the Flood under control, even if it means wiping out all life in the galaxy. Later games focus on the emergence of a new threat, the Prometheans. The games span a period of five years, along with Reach, a prequel set a few months before the first game and depicting the Covenant launching a full-scale invasion of the human colony world of Reach, home to 700 million people. A potential TV series could be set at any point in the games' timeline, or even earlier or later, focusing on different characters and situations altogether. Spin-off novels, including some written by hard SF author Greg Bear, are set thousands of years earlier during the construction of the Halos, though it's less likely that a TV show would move so far away from the familiar iconography of the games. More news as it is revealed. A return for this long-dormant feature, this time focusing on the race known as the Time Lords, from the popular British SF series Doctor Who. It should be noted that for this article I drew on the TV show alone. The spin-off novels and comics feature a ton of further information on Gallifrey, Rassilon, the Time War and so on, but these are of questionable canonicity and sometimes completely contradict one another. As a result, the only source I used was the TV show. Gallifrey, the homeworld of the Time Lords. The Time Lords are a humanoid species originating on the planet Gallifrey. The Time Lords are noted for their mastery of time and space, as they were apparently the first species in the universe to develop time travel technology. Originally they pursued an aggressive, interventionist policy but several disasters led to them instead adapting a policy of non-intervention in the affairs of other worlds and times. Several renegade Time Lords have broken this rule, some very frequently, to the consternation of the rest of the race. The Doctor is a Time Lord and the most well-known being of that species. The Time Lords appeared irregularly throughout Doctor Who's original run. When the second run of the show began in 2005 a new backstory was adapted stating that the Time Lords had been annihilated in a mutual war of destruction against the Daleks, with the Doctor as the sole survivor of the race. The relaunch also suggested that the Time Lords had become militaristic and belligerent during the war, and ultimately became as dangerous to the rest of the universe as the Daleks. The Capitol on Gallifrey and one of the Time Lords. The planet Gallifrey was located in a galaxy approximately 250 million light-years from Earth. Gallifrey was part of the Kasterborous cluster of seven stars, all with notable habitable worlds. Gallifrey was known as the Shining Jewel of the Seven Systems. There were six planets in the Gallifreyan system (including Gallifrey itself). One of the neighbouring planets, Karn, was also (barely) habitable. By the time of the Time War, Gallifrey had become a somewhat desolate planet, dominated by deserts, volcanoes and towering mountain ranges. The planet was several times larger than Earth but apparently enjoyed an Earth-like gravity field, suggesting it was not as dense in terms of its geophysical make-up. In the absence of evidence to the contrary, it is assumed that the Gallifreyan humanoids evolved on the planet over a period of hundreds of millions of years, like the humans of Earth. 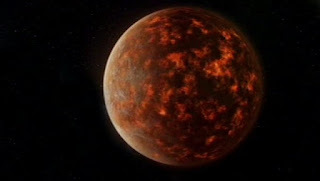 It may be that Gallifrey's desolation by the time of the Time War may have been a result of industrial pollution or worldwide wars in the past, as well as the Time War itself (though it should be noted that pre-Time War Gallifrey is also shown to be fairly desolate, though much less volcanically active). Given the Time Lords' supreme technological mastery, including the ability to move planets and travel through time, it is unclear why they never used their skills to make Gallifrey a more pleasant place to live. The length of the lifespan of Gallifreyan civilisation is not entirely clear. It has been suggested that the Gallifreyans achieved sentience and technological mastery some seven billion years ago, with one Time Lord claiming that they have had transmat technology since the universe was 'less than half of its current size'. However, this may have also been a reference to the Time Lords using such technology in the distant past, having travelled back to a time before their own world was formed. Another reference to the Time Lords leading a coalition of races in a war against the Racnoss Empire before the Solar system formed (roughly five billion years ago) could also be referring to a war fought at a certain point in time chosen by the Time Lords, rather than the suggestion of billions of years of continuous existence by a single species. Omega, as encountered during his long exile in the antimatter universe. What is known is that Gallifreyan civilisation underwent its most profound transformation when two scientists, Rassilon and Omega, created time travel technology. Much of the technical work was done by Omega, who piloted a craft to trigger a nova in another star and then capture the star at the moment of its collapse into a black hole, creating an inexhaustible supply of energy. The experiment was a success, but Omega's craft was apparently destroyed in the process. 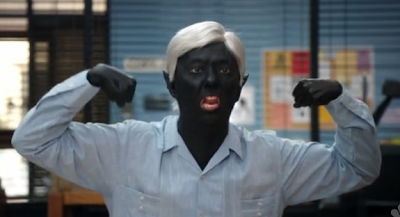 It was later revealed that Omega in fact survived, but had been cast through the black hole into an antimatter universe, where he would remain trapped for many, many years (from his perspective, centuries and potentially several millennia). Rassilon, completing his work, created a transtemporal link to the black hole underneath the Capitol, the largest city on Gallifrey. This link became known as the Eye of Harmony and would provide Gallifreyan civilisation with its power. The Hand of Omega, the 'stellar manipulator' used by Omega to trigger the nova, survived the incident and was placed under high security on Gallifrey. Over the following decades, Rassilon founded what became Time Lord civilisation. The earliest space/time vessels known as TARDISes (Time And Relative Dimension In Space) were built. A time lock was established on both Gallifrey's past and future, preventing Time Lords from travelling back or forth. This lock also seems to have prevented Time Lords from crossing one another's time streams (in all but the direst of emergencies), ensuring that Time Lords encounter one another and Gallifrey always on contemporary terms. Rassilon in his final incarnation, as encountered during the Time War. Rassilon also developed the Imprimatur, a genetic modification which allowed Time Lords to endure the rigours of time travel and was used to form a symbiotic bond between each Time Lord and his or her TARDIS. It has been theorised that the Rassilon Imprimature was the piece of genetic engineering which granted the Time Lords both a tremendously extended lifespan (at least seven centuries per incarnation) and the ability to 'regenerate' into a new form twelve times. This would give Time Lords lifespans measured in the millennia. However, Time Lords taking part in time travel would also be exposed to dangerous and frequent hazardous situations and many would likely burn through their regenerations much more quickly. It is unclear if all Gallifreyans were given this ability, and thus the terms 'Gallifreyan' and 'Time Lord' are interchangeable, or if only a small elite of Gallifreyans were transformed thusly into Time Lords, with the bulk of the race consisting of the shorter-lived 'original' humanoids. It is known that the process granting regenerations is transferable to humanoid races from both Tremas and Earth, suggesting that non-Gallifreyan Time Lords are possible. Whether any exist beyond the one confirmed (the Master, though originally a Gallifreyan, transferred his consciousness into a human body on Earth which was subsequently granted the power of regeneration during the Time War) is also not known. However, it is clear that Time Lords nearing the end of their life cannot simply get a new set of regenerations, suggesting that the process can only be used once per humanoid body. During Rassilon's lengthy period of rule, the High Council of the Time Lords was established, with himself as its President Eternal. During Rassilon's rule the Time Lords found themselves at war with a species known informally as the 'Great Vampires'. A brutal and bloody war was fought through time and space which the Time Lords won by the deployment of extremely formidable vessels known as bowships. 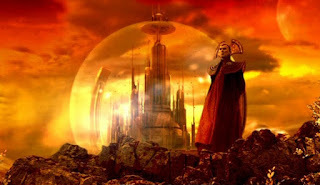 It is possible that Gallifrey itself was threatened during this war, which may have led to Rassilon's creation of the Transduction Barrier, an impregnable forcefield surrounding the entire planet. Though the Time Lords won the war, they failed to kill the vampire leader, a task finally accomplished many millennia later by the Doctor (who found the vampire leader hiding on a planet in another dimension, E-space). Following this period, the Time Lords appear to have spent at least some time as an aggressive, expansionist and interventionist species. 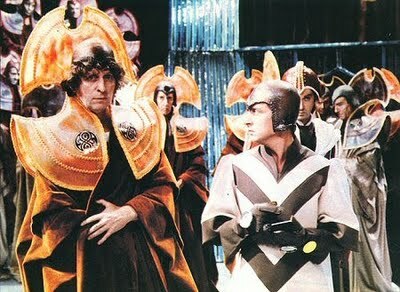 The Time Lords brought various species to Gallifrey and made them fight to the death in an area called the Death Zone. They were worshipped as gods on the planet Minyos and the Time Lords gave the Minyans advanced technology (including a very primitive and painful form of regeneration). However, the Minyans used their advanced technology to destroy themselves and their planet, with only a small group escaping into space to colonise another planet. Rassilon also created a powerful weapon which removed the target from space/time altogether, the Demat Gun, though its use was heavily restricted. After this time the Time Lords seem to have become wiser and less cruel. The Death Zone was shut down and a policy of non-intervention in the affairs of other worlds and times was adopted. Rassilon succeeded in developing a form of immortality, but also became aware of how dangerous it was. He apparently died, taking the secret with him. His body was entombed in the Tomb of Rassilon within the Death Zone, to discourage grave-robbers. 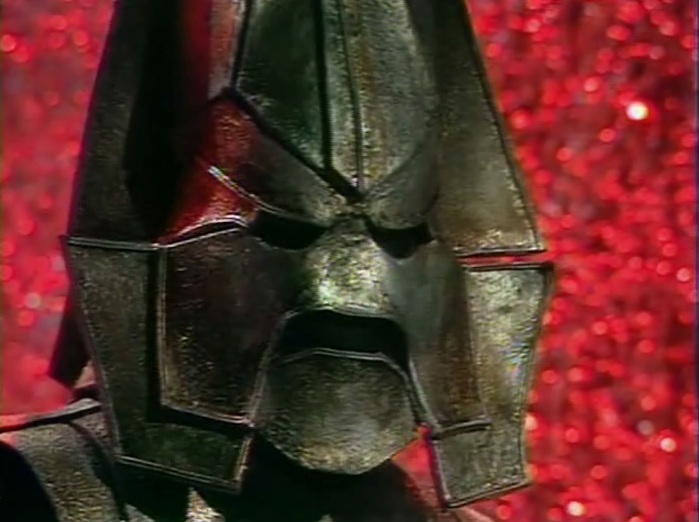 Curiously, despite lying in state for thousands of years, Rassilon's body never decayed. In the meantime, Time Lord civilisation continued along fairly without incident until the arising of two young men from the Time Lord Academy. One would become known as the Doctor and another, originally his best friend, would become known as the Master. 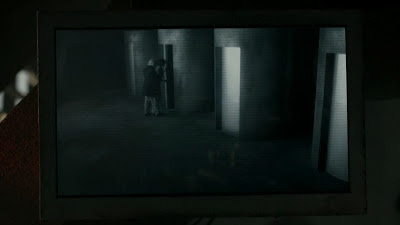 The Doctor and Susan stealing the TARDIS from the repair dock on Gallifrey. The Doctor's original name and status on Gallifrey was not known. What was known was that he took that name for himself and stole a Type 40 TARDIS whilst it was in the repair dock. He fled Gallifrey with his granddaughter (who eventually took the human name Susan) and disappeared into the space/time vortex. 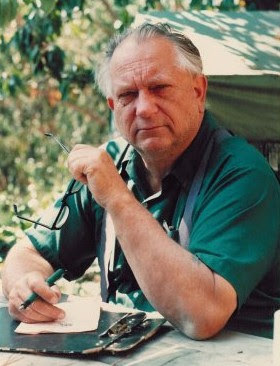 The reasons for the Doctor's flight are also unclear: it's been suggested he was simply bored and wanted to see the universe, whilst others suggest he might have been involved with the Celestial Intervention Agency (CIA), a body which officially did not exist but which carried out clandestine and deniable operations involving other species. The Doctor apparently took with him the Hand of Omega, the stellar manipulator used to create the Eye of Harmony, suggesting he had a grander scheme in mind. The Doctor fled to Earth in the year 1963 (where the TARDIS adopted the form of a local police telephone call box), where he had the Hand of Omega buried in a churchyard and Susan enrolled at a local school. His further plans were not known, as the intervention of two of Susan's teachers, Ian Chesterton and Barbara Wright, caused him to dematerialise the TARDIS. At this point the reason the TARDIS was in the repair dock became clear: its chameleon circuit jammed, leaving it in the shape of a police box near-permanently, and it became impossible to steer. Instead, the TARDIS would randomly leap from world to world and catastrophe to catastrophe, embroiling the Doctor and an ever-changing roster of companions into many different adventures. The Time Lords were aghast at the Doctor's interventions but were unable to intercept him, as he stayed on the move and the random movements of his TARDIS were completely unpredictable. It's possible this state of affairs would have continued, except that the Doctor - now in his second incarnation - finally encountered a situation that was way too large for him. An alien race allied with a renegade Time Lord known as the War Chief had used stolen Gallifreyan technology (primitive proto-TARDISes known as SIDRATs) to imprison hundreds of thousands of soldiers from throughout Earth's history on a distant planet and forced them to fight one another. Though the Doctor was able to defeat the War Chief and his alien superior, the War Lord, he was unable to rescue all of the different soldiers and had to call in the Time Lords to fix the situation. The Time Lords agreed, but forced the Second Doctor to stand trial for his crimes. The Doctor argued passionately that the Time Lord policy of non-intervention had allowed the arising of powerful hostile alien races, some of them also pursuing time travel technology (such as the Daleks). The Time Lords believed that the Doctor had a point. They punished the Doctor by forcing him to regenerate ahead of time and exiled him to Earth in the late 20th Century, his TARDIS rendered non-operational. During this time the Doctor helped defend Earth from attacks by several alien species. The Doctor also encountered his best friend turned nemesis, the Master, at this time. The Master in the thirteenth incarnation of his original body. Like the Doctor, the Master had fled Gallifrey to explore the universe in a TARDIS (though a more sophisticated one than the Doctor's). Despite being a contemporary of the Doctor's, the Master burned through his regenerations much more quickly. 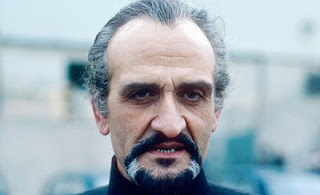 The version of the Master encountered on Earth in the 1970s was in his thirteenth and final incarnation. The Master's presence was of concern to the Time Lords, who allowed the Doctor to try to bring the Master to justice. They also allowed the Doctor to briefly use his TARDIS to leave Earth and thwart the Master's plans on another world in the far future. The Doctor's success also inspired the Time Lords to allow him to leave Earth on other occasions (including a trip two thousand years into the future to the planet Peladon), indicating that they had become more convinced by the Doctor's argument that intervention was occasionally necessary. Gallifrey then came under attack from an unexpected source: a black hole. With the planet's energy failing, they assigned the Doctor to investigate. With things growing more desperate, they allowed the Doctor to break the laws of time by joining forces with his first two incarnations to investigate the matter. They learned that Omega, the creator of the Eye of Harmony, had not been killed but had been blasted into an antimatter parallel universe, from where he plotted to take revenge on the Time Lords who had abandoned him. The Second and Third Doctors entered the antimatter universe and tricked Omega into apparently destroying himself, ending the threat. The Time Lords, saved, rescinded the Doctor's exile and allowed him to return to wandering through time and space. From this point on, the Doctor's wanderings would be mostly the result of random chance or his own choice of destination, but the Time Lords would occasionally direct his adventures. During a confrontation with both the Master and the Daleks in the 26th Century, the Time Lords directed the TARDIS to the planet Spiridon, where a massive Dalek army was gathering, so the Doctor could destroy it. Several years later, having regenerated into his fourth incarnation, the Doctor and his companions were intercepted by the Time Lords and sent to Skaro, the Dalek homeworld, in its distant past. The Time Lords informed the Doctor that they had discovered a possible future in which the Daleks had destroyed all other life in the universe. To avert this possibility, the Doctor was instructed to destroy the Daleks at the very moment of their creation. The Doctor failed, though his actions did change the timeline: the development of the Daleks was retarded by millennia and the Daleks' creator, Davros, survived. Whilst this seemingly averted the inevitable victory of the Daleks, it was also a declaration of war, and later historians would point to this as the very first shot of the conflict known as the Time War. The Fourth Doctor visits Gallifrey. Two years later, now travelling without a companion, the Doctor returned to Gallifrey and became embroiled in a complex plot to murder the President of the High Council. The Master was found to have been responsible. The Master had attempted a thirteenth regeneration, breaking the twelve-regeneration limit, and had paid the consequence by being reduced to a barely-living husk. The Doctor defeated the Master's plans, but the Master was able to escape. More than a year later, the Doctor returned to Gallifrey to help avert the invasion of the planet by the alien Vardans, initially by posing as their ally. However, the Vardans were providing cover for the real invaders, the Sontarans. Again the Doctor was able to defeat the invaders, this time by deploying Rassilon's formidable Demat Gun to annihilate them. Many years later, after the Doctor had regenerated again, Omega returned and once again threatened Gallifrey with destruction. The Doctor defeated him once more. Shortly afterwards the Time Lords were alarmed when an unknown force breached the Doctor's timestream and transported his first five incarnations into the Death Zone on Gallifrey. The Time Lords themselves recruited the Master to help find out why. It turned out that the Doctor was being used as a canary in a mine, sent into the Death Zone to spring all the traps and open the way to the Tomb of Rassilon. The perpetrator was Borusa, President of the High Council. Approaching his final regeneration and death (unknown causes having resulted in him going through four incarnations in the same period the Doctor had gone through just one), Borusa yearned to discover Rassilon's secret of immortality which had been sealed in the tomb along with his body. The plan backfired when it was discovered that Rassilon had never died in the first place, instead going into lenghthy suspended animation. Rassilon turned Borusa to stone for his impertinence and returned to stasis, allowing the Doctor to go on his way. Shortly after this the Doctor was engaged in battle by the Daleks, who planned to send duplicates of the Doctor and his companions to Gallifrey to assassinate the High Council of Time Lords in retaliation for the Time Lords' attempt to wipe them out at the moment of their creation. Several years later the Doctor was put on trial again by the Time Lords, though it turned out to be a manipulation by a future, potentially evil incarnation of the Doctor. During this 'trial' it became clear that corruption had started to seep into the fabric of Time Lord society, with some Time Lords being willing to blame the Doctor for one of their own interventions that had gone hideously wrong. Not long after this, when he was in his seventh incarnation, the Doctor travelled to Earth in November 1963 to retrieve the Hand of Omega, the device Omega had used to create the Eye of Harmony and begin powering Time Lord civilisation. In actuality, the Doctor's plan was to trick the Daleks into destroying themselves, but was not expecting two separate and mutually hostile groups (the original, now 'renegade' Daleks and Davros's Imperial Dalek faction) to show up. In the end, Davros's Imperial Daleks assumed control of the Hand and sent it back to Skaro, planning to create for themselves a power source to rival the Time Lords'. Instead, the Hand, pre-programmed by the Doctor, caused Skaro's sun to go supernova, vapourising the entire star system and wiping out the Imperial Daleks in one go. The result of these hostilities was that the Daleks of the far future, beyond the 201st Century, planned to make war upon the Time Lords. Aware of the growing tensions, President Romana chose to appease the Daleks by giving the Master to them. The Master had betrayed the Daleks on at least one occasion of cooperation, leading to them hating him almost as much as the Doctor. The Daleks exterminated the Master, but the Master had taken preventative action and enabled his essence to escape in a serpent-like form. The Doctor, shortly after regenerating into his eighth form, defeated the Master on Earth but was unable to return him to the Daleks for a final extermination, as the Master had toppled into the TARDIS's link to the Eye of Harmony. As a result, it appears that open warfare between the Daleks and the Time Lords broke out. Gallifrey at the end of the Great Time War. The Great Time War was a conflict unlike any other in history. The war raged on multiple battle fronts across thousands of worlds and multiple galaxies. Both sides invoked allies, but lesser species were not able to take part. Particularly affronted by this were the Sontarans, the only alien race to ever successfully (if extremely briefly) invade Gallifrey. Other powerful, higher races (such as the Eternals) fled this reality rather than stay and witness the conflict. Billions of sentient beings were killed and entire worlds and star systems were annihilated. Both sides were pushed into using their own war criminals as soldiers: the Daleks (although descended from the 'renegade' faction) used Davros's knowledge and experience, but he vanished early on in the conflict. The Time Lords retrieved the Master from the Eye of Harmony and gave him a fresh set of regenerations to help them. However, the fighting became so intense and the stakes so great that even the Master was terrified. He fled to the remotest future, the end of time itself, and transmogrified himself into a human, erasing all memories of the Time War and his old life. Ultimately, the Time Lords re-awoke Rassilon. Rassilon agreed to take charge of the war, as he had done once before against the Great Vampires. More formidable and terrible weapons of war were unleashed: bowships from the old times and Battle TARDISes were deployed on a vast scale. The Daleks made use of other allies and weapons, such as the Cruciform and the Nightmare Child. The war escalated, until in its final days the Doctor estimated that millions of people were dying and being resurrected every day as time was written, rewritten, changed and undone. Rassilon decided to use the Ultimate Sanction, a force that would destroy the entire universe and allow the Time Lords to ascend to a higher form as beings of pure energy. The Doctor realised he could not allow this to happen. Deploying a weapon known as the Moment (which some claim - with doubtful veracity - was the old Demat Gun but made to work as a weapon of mass destruction, on a vast scale against millions of beings simultaneously), he obliterated Gallifrey and the Daleks' new homeworld both, along with their respective war fleets. Gallifrey burned and billions died. Whatever the Doctor did was so horrendous that the entire Time War became time-locked, sealed away from the rest of the universe and impenetrable to time travellers from any direction. The Doctor himself paid with his life, undergoing regeneration. However, it is not known how the Doctor alone was able to escape from the time lock into the outside universe. 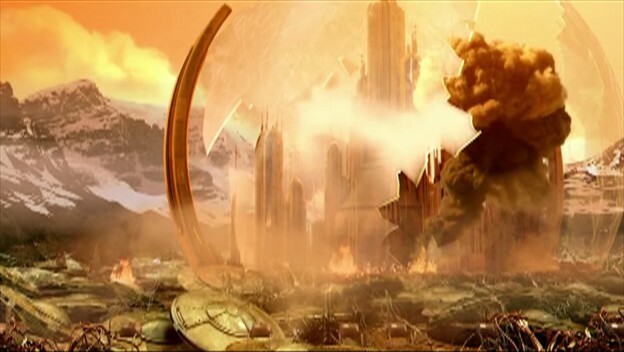 At the moment of annihilation, the Time Lords manipulated the Master (whom they knew had fled) into pursuing a course of action that would ultimately lead to their salvation, with Gallifrey being pulled out of the Time Lock into the vicinity of Earth so they could use the Ultimate Sanction. The Tenth Doctor and the Master defeated Rassilon and the Time Lords, returning them to the time lock and their annihilation in the Moment. The Master also apparently perished at this moment and the Doctor was also killed, undergoing regeneration into his eleventh form. 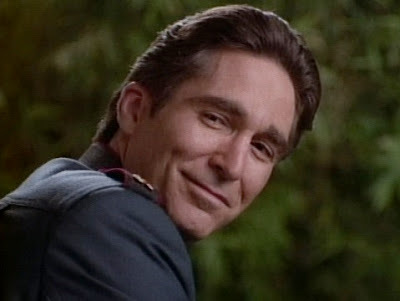 It is generally held that the Eighth Doctor fought in the bulk of the Time War and was the Doctor who was killed at its conclusion, undergoing regeneration into the Ninth. However, recent rumours claim that the Doctor had another form between his eighth and ninth selves who carried out the Moment, an act of desperation and barbarism on such a scale that it went against everything the Doctor stood for despite the overwhelming circumstances. The truth of this claim remains to be seen. Regardless, the Time Lords are now considered to be extinct. The elimination of the Time Lords has seen those aspects of time travel that they regulated, such as interdimensional travel, become much more dangerous and difficult. Other races that did not apparently possess time travel (possibly due to Time Lord interference) subsequently did: humans in the 51st Century developed primitive time travel technology whilst prior to the Time War it appears that humanity never mastered the technology. Damage to the timeline became more dangerous without the Time Lords being around to help fix it. The Doctor became the last of the Time Lords. Timothy Dalton, David Tennant and John Simm during the filming of The End of Time, 2009. When he first appeared on-screen in 1963, the Doctor was identified as an alien, travelling from world to world with his granddaughter Susan. Little more information was given out, and some of what was revealed was contradictory. In truth, the writers and producers of Doctor Who didn't know and didn't care particularly about the Doctor's origins, feeling they would not be a major focal point of the show. However, the 1965 story The Time Meddler did introduce another member of the Doctor's own race, the Monk, equipped with his own TARDIS, and the possibilities of revisiting the Doctor's origins became clearer. At the end of the sixth season in 1969, it was planned that the show would switch to being made in colour. Patrick Troughton was also expressing a desire to move on. The producers decided that the show would undergo a total format reboot, arguably the first of its kind in the show's history (the later serial The Leisure Hive in 1981 would also feature a reboot and update of the way the show was produced, although of lesser magnitude). As well as moving to colour there would be a total replacement of the cast: a new Doctor and companion would come in simultaneously and there would be other recurring cast members. To save money (as the move to colour was expensive) the show would also be set on present-day Earth with no visits to alien worlds (which were always expensive to shoot but ended up looking shoddy). There would also be more focus on action and contemporary issues (such as nuclear power, the environment and the Space Race). To explain the massive shake-up, the producers decided that the Doctor's past would catch up with him. Building on the earlier hints that the Doctor had stolen the TARDIS to see the universe, it was decided that he was on the run, a fugitive and criminal, and his people wanted him back. His people were named the 'Time Lords' and would appear in the Second Doctor's final story, The War Games. From this point onwards, the Time Lords would remain an ongoing part of the Doctor Who storyline and mythos. They briefly reappeared during the Third Doctor's run, along with Omega, but it was Robert Holmes's The Deadly Assassin in 1977 which firmly established a lot of the background and lore behind them, including mentions of the Eye of Harmony, Rassilon and the different chapters. Robert Holmes was also the writer responsible for naming Gallifrey, which he did in 1973's The Time Warrior (rather oddly, after years of ducking the issue, the Doctor just casually reveals the name of his homeworld to the first Sontaran to appear on the show). Holmes also established the twelve-regeneration limit for Time Lords. Despite establishing a lot of the backstory and lore, Holmes didn't play much more of a role in their development (though he did introduce the idea of the Rassilon Imprimatur in The Two Doctors). Instead other writers would develop the Time Lords rather roughly and ad hoc as they continued to reappear. The biggest problem with the Time Lords is that they provided too much of a safety net for the Doctor to fall back on, especially once he was back on friendly terms with them (and indeed serving as titular President of the High Council, as he did from The Five Doctors through the end of the series). There were also problems finding interesting things for them to do: the Doctor being put on trial by them twice shows some a lack of imagination in how to handle them on the show. When Russell T. Davies resurrected the show in 2005, his answer was to simply wipe them out in a mutual war of annihilation against the Daleks. Davies even used some of the events from the original series to justify the conflict: the Time Lords trying to wipe out the Daleks at the moment of their creation in 1975's Genesis of the Daleks; the Daleks trying to send android duplicates of the Doctor and his companions to wipe out the High Council in 1984's Resurrection of the Daleks; the Doctor blowing up Skaro in 1988's Remembrance of the Daleks; and the Time Lords handing the Master over to the Daleks in the 1996 TV movie. The removal of the Time Lords from the mythology and making the Doctor the last of his race had interesting dramatic ramifications for the series and the character of the Doctor. The true course of the Time War would be teased out over many episodes until it was eventually possible to assemble a very rough idea of the course of the war. However, Davies also used the Time War as an excuse to explain away any potential continuity errors within the show, since what happened in the prior run of the series could have been changed or undone by the Time War. Of course, Davies would not be able to resist bringing back first the Master and later on the Time Lords themselves for David Tennant's final story (complete with Timothy Dalton playing Rassilon!). Fans continue to ponder if the Time Lords will be restored at some point in the future, when the show needs another big shake-up, and that is certainly possible (Dalek Caan penetrating the time lock to save Davros, even at the cost of its own sanity, shows there is a way of doing this). For now, the Time Lords with their unfeasibly big collars are gone and the show has benefited from their absence so far, making the Doctor a more important and solitary figure as a result. Bowships: Immense Time Lord spacecraft which fired huge projectile weapons. Necessary to kill the Great Vampires. Re-used in the Time War. Capitol, The: Largest city of the Time Lords on Gallifrey. Demat Gun: Weapon which obliterates the target and removes it from the space/time continuum altogether. Eye of Harmony: Link to the black hole used to power Time Lord civilisation, including all TARDISes. Sometimes used to refer to the black hole itself and the TARDIS's power source. Gallifrey: Homeworld of the Time Lords. Great Vampires: Alien species who fought an early war against the Time Lords. Defeated by Rassilon using bowships. Hand of Omega, The: Stellar manipulation device, capable of collapsing stars. Used by Omega to create the Eye of Harmony. Used by the Doctor to destroy the Dalek homeworld. High Council: The ruling body of the Time Lords, headed by an elected President. Moment, The: Weapon of mass destruction. Used by the Doctor to end the Time War. Omega: Gallifreyan scientist, creator of the Eye of Harmony. 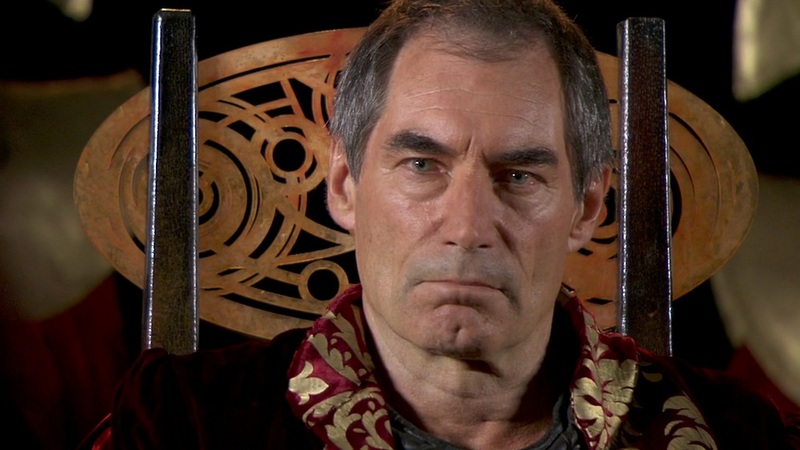 Rassilon: Gallifreyan scientist and later politician, first President of the High Council. Omega's contemporary and partner. Founder of Time Lord civilisation. Discovered immortality and entered stasis for millennia. Awoken to fight in the Time War. Rassilon Imprimatur: A form of genetic engineering which allows Time Lords to travel through time and achieve a symbiotic link with their TARDISes. Theorised to also enable regeneration. Regeneration: Process by which a Time Lord undergoes total body rejeuvenation, returning every cell to a healthy state and retaining memories but in the process creating a new consciousness and personality. Each Time Lord can regenerate up to twelve times before dying, with each body living for seven or so centuries. TARDIS: Time and Relative Dimension in Space. A vehicle capable of space/time travel. Time War or Last Great Time War: Conflict in which the Time Lords and Daleks fought to their mutual destruction. 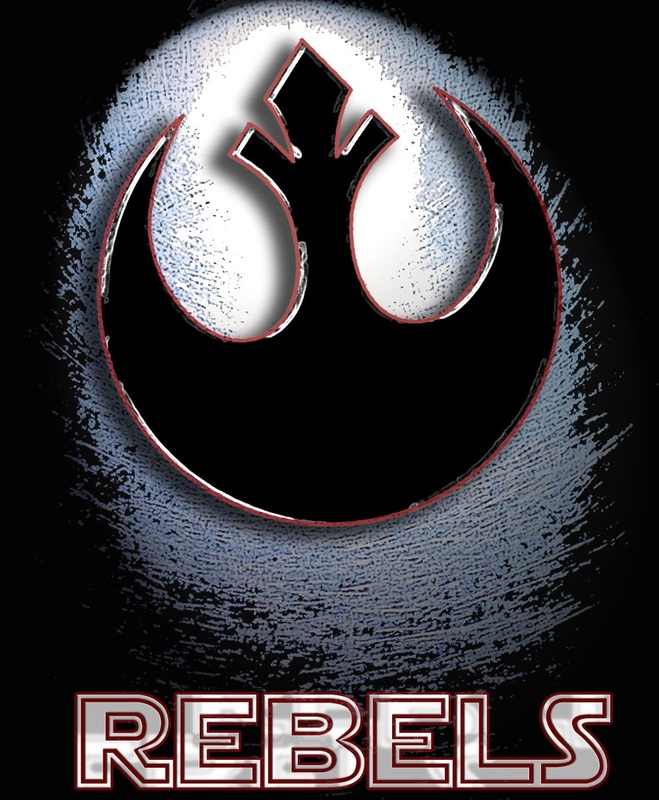 Lucasfilm have announced a new Star Wars CGI TV series is being made, entitled Star Wars: Rebels. This series will be set between Revenge of the Sith and A New Hope and will be heavily influenced by Ralph McQuarrie's concept art for the original trilogy of movies. Not from the TV series, but a logo from some upcoming novels. The production team is a mixture of veterans of Star Wars: The Clone Wars, other animated projects and some people involved in Episode VII and the other new live-action films. The setting is telling since Lucasfilm and Disney had previously indicated that all new Star Wars media going forwards would be set in the Episode VII time period, but clearly that's no longer the case. This may renew hopes that the abandoned LucasArts game 1313 might yet be salvaged, and Obsidian's planned new Star Wars RPG might also be in with a shot of getting made. Most interesting is the fact that Rebels seems to be set in the same time period as George Lucas's planned Star Wars live-action TV series, only with more of a rumoured emphasis on the Rebel Alliance rather than on bounty-hunters. Whether this means that Rebels replaces the planned live-action show, or if that will still reach the screen later on, is also unclear. Star Wars: Rebels will debut in the autumn of 2014 with an hour-long special on the Disney Channel. 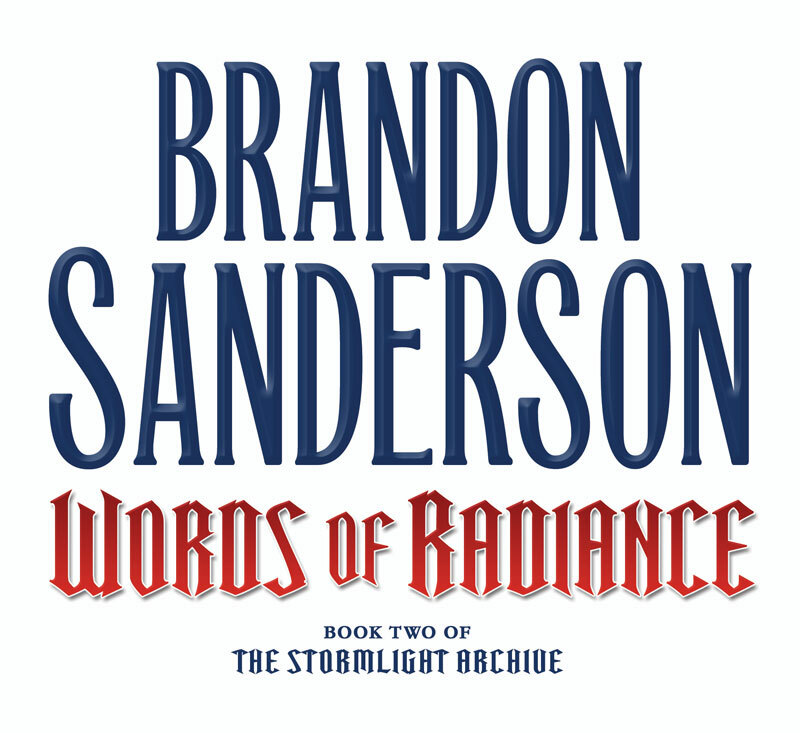 Via his email letter, Brandon Sanderson has provided an update on his progress on Words of Radiance, the second volume in The Stormlight Archive (and the sequel to 2010's Way of Kings). 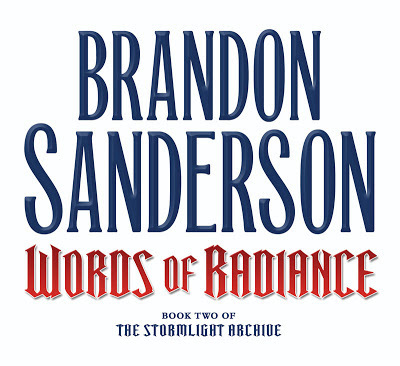 According to Sanderson, he has 260,000 words completed out of a targeted 300,000 (making Words of Radiance almost 25% shorter than Way of Kings), but has run into some issues keeping the book more cohesive and structured and needs to do some rewriting based on that. 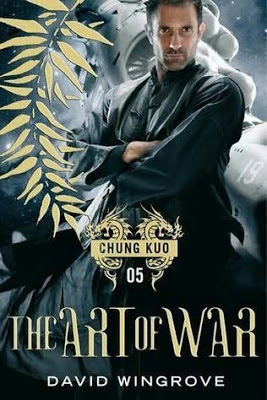 He hopes to finish the book in August so he can still hit the planned release date of November 2013, but acknowledges that there is a chance the book could slip to early 2014 instead. In this idea, the film takes place from two different perspectives. In the first, we follow a group of real-life D&D players. They're in the here and now and meet up once or twice a week to play the game. When they're playing, rather that us just watching some people sit around a table, instead we slip into the D&D game itself. 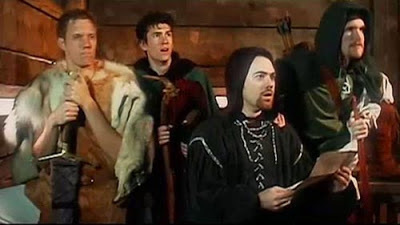 The same actors are now playing the players' characters, swinging swords, firing lightning bolts and pausing in mid-action for fifteen minutes whilst someone tries to perform a grapple check. There are a lot of effects. It's all kind of awesome, except it's interspersed with scenes of the players playing around the table. You could show how random out-of-game decisions are portrayed in the game world. This could include the classic dodge of one character dying, so the player creates a new character who bumps into the old adventuring party, usually somewhere incongruous like the middle of a vast desert or ruined temple, and is immediately accepted into their ranks with no questions. Of course, this is such a good idea that it's already been done several times, most notably in Dead Gentlemen Productions' very fine Gamers trilogy of fan films (the first movie even has the unconvincing replacement character scene). My preference would be to remake one of them and give Dead Gentlemen a truckload of cash for the pleasure. Also, for added geek-cred, you could cast well-known real D&D players in the film, like Wil Wheaton, Felicia Day and of course Vin Diesel. How about Diesel as the DM? Who'd ever argue with a decision? In addition, with this sort of project you can make it as high or as low-budget as you like, and vary the tone from comedy to drama and back again. Most importantly, it is true to the D&D experience in a way just a generic fantasy movie isn't. Actually, this has already been done but few people ever saw it. Mainly because it was a bit rubbish (though still the best D&D movie made to date), but also the fact it was animated put a lot of people off. Still, as far as 'classic D&D narratives' go, this is the most obvious to go for. 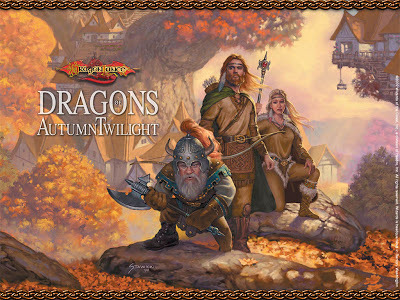 It has built-in franchise appeal (the core Dragonlance mythos consists of two trilogies of novels, with a multitude of spin-off books and a later series of less well-received sequels), some fairly iconic characters and some spectacular action set pieces. These include massive aerial battles featuring dragons, dungeon adventuring, storming an ice castle and spooky encounters in haunted forests. 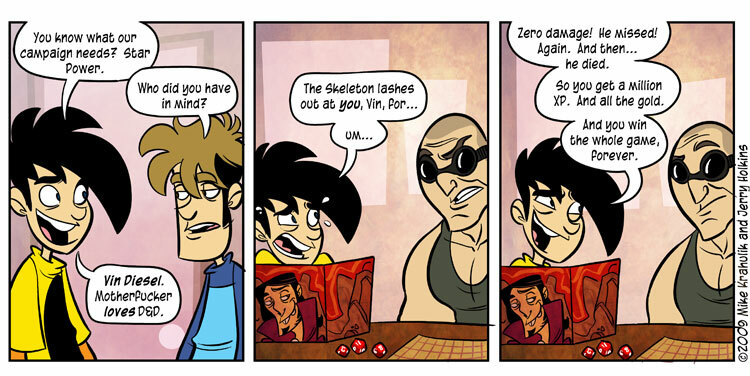 It pretty much encapsulates a lot of the traditional D&D tropes into one story. Originally published in 1988, The Crystal Shard, a novel set in the Forgotten Realms world, has become one of the best-known and most iconic D&D novels. It introduced the world to the character of Drizzt Do'Urden, a drow (or dark elf) ranger. Unlike most of the rest of his species, which was cursed and evil, Drizzt was noble and honourable, seeking to live in peace away from his evil kin. And kick ridiculous amounts of arse. 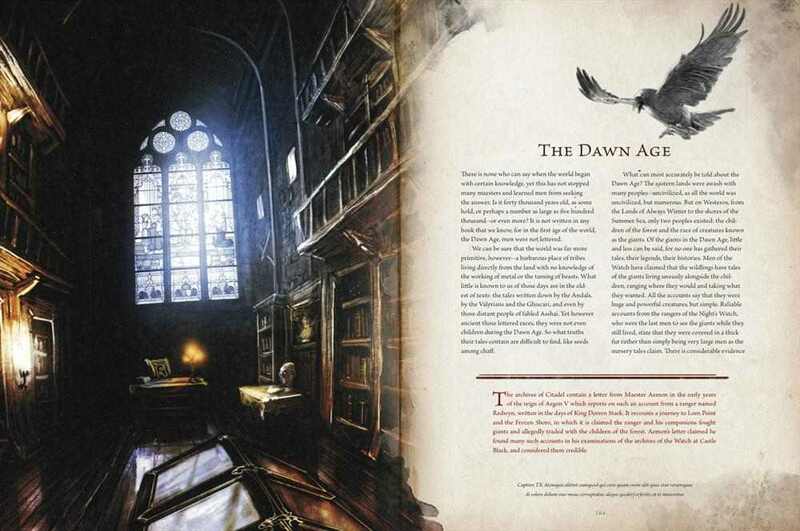 Whilst later Drizzt books can be charitably described as 'formulaic', the early books were (relatively speaking here) fairly engaging action-adventure stories. Drizzt was a (very much speaking relatively here) complex character and author R.A. Salvatore gave him a lot of character stuff to work through, including parenting issues, the problems of racism and how to make friends with people when you're going to outlive them by centuries. 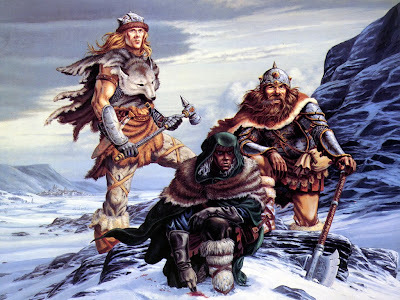 In addition to that, The Crystal Shard has the benefit of being an ensemble (Drizzt is just one of a team, unlike later books in which he becomes the dominant hero) and also of being self-contained: it was later retconned as Book 1 of The Icewind Dale Trilogy, but its own narrative ends in the first instalment, with a simple segue into further adventures at the end. Whilst there are also major effects moments (a battle with an ice dragon in its lair; the people of Ten Towns fighting off a monster assault; a duel between Drizzt and a demon), it also wouldn't be quite as expensive as a Dragonlance movie. It'll be interesting to see how this all pans out after the litigation is over, and what sort of film we get. One of the Endless has fallen, so there must be a wake. As the millions whose lives they touched gather to remember the fallen, a new Endless must arise to take their place. Note: normally I try to stay spoiler-free in reviews (even if the book has been out for seventeen years). However, it's simply impossible to discuss this collection without spoiling the biggest plot twist in the entire Sandman series, so be forewarned before continuing. 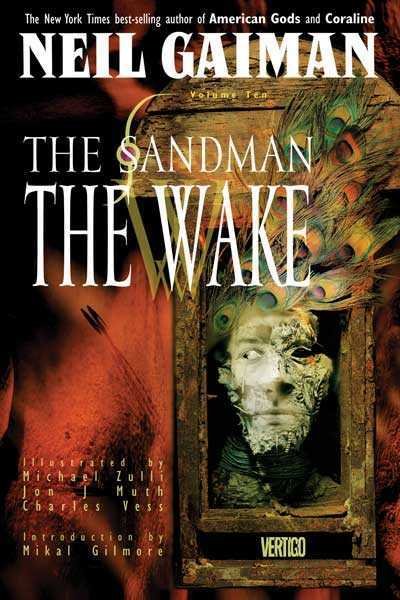 The Wake is the tenth and concluding graphic novel in the Sandman sequence. It is an extended coda to the main narrative of the series, which climaxed in the preceding book, The Kindly Ones. As such the story is about wrapping up (or at least addressing) loose ends, revisiting some old characters and paying off some old debts. There's no real threat or tension in the narrative, just a loosening of the pace that allows Gaiman to quietly (but still effectively) develop and round off character arcs and leave the series with grace. The first three parts of The Wake form a single narrative. A wake is held for Morpheus (who died at the end of The Kindly Ones) and beings from across the universe arrive to take part. There are numerous cameos from familiar characters (including brief ones from Superman and Batman, since Sandman is part of the DC Universe) and Daniel, the 'new' Dream, frets about his new role as he rebuilds the Dreaming. There is some tension to be mined from Daniel's meeting with Lyta Hall (who was arguably responsible for Dream's death) and from Matthew's decision to remain in the Dreaming or not, but mainly the emphasis here is on the loss and how it effects the other characters in the series. Wisely, after setting it up as a big event, Gaiman chooses not to show us the first meeting between Daniel and the rest of the Endless (in some parallel universe where Gaiman cashed in and sold out, we can imagine that scene as the opening of The Sandman II). The latter three parts are more diverse. In the first, Hob Gadling attends a terrible American Renaissance Faire. 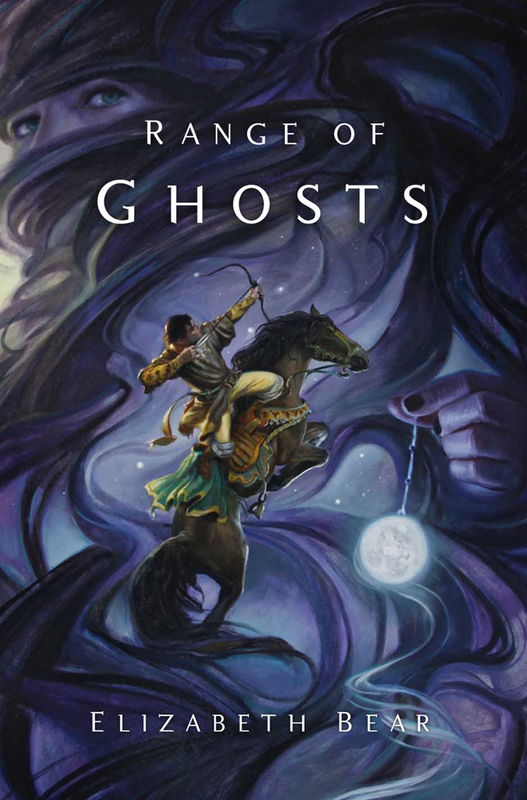 Gadling is six hundred years old, the result of a bargain between Dream and Death, and is horrified at the romanticising of the England of his youth, a place of plague and death where life was cheap. Gadling, who is now dating an African American woman, is also wracked by guilt over the spell of his life he spent dealing in slaves. Ultimately Gadling is offered the chance by Death to end the bargain and die, since the other partner in the bargain is also dead. Gadling has always been one of the more interesting characters in the Sandman series, appearing intermittently since the early issues and providing Dream with arguably the only true friend he has. This story sees Gadling severing his ties with the dead Dream and moving on with his life in a touching and human way. In the penultimate part of the series, Gaiman cheekily takes a big risk ("What are they going to do? Stop buying it with one more issue to go?") by having a story told mostly in text, in which a Chinese government minister from a thousand years ago is exiled into the desert and inadvertently passes through a 'soft place' into the edge of the Dreaming, where he meets both Morpheus and Daniel at different parts of their existence. It's a bizarre and existential story which is intriguing and amusing (especially with the cameo from a cat). In the final part, we suddenly reverse back to the early 17th Century. William Shakespeare has decided to end his writing career, but has to fulfil a promise: the second of two plays commissioned by Dream. As he labours on the work - a play called The Tempest - Shakespeare reviews his life, considers his legacy and muses on the choices he did not make. He wonders if a person can every truly change, and of course this what the entire series was about: Dream coming back from his captivity a changed being, but in the end not able to change enough, resulting in his destruction. The Wake (****½) is not a blood-and-thunder grand finale, but instead it's an effective analysis and wrapping-up of what has come before. There are perhaps minor signs of the author overdoing it (dedicating three issues to a funeral and wake might be seen as over-indulgence), but for the most part Gaiman restrains the sentimentality in favour of an attempt to finding meaning in life and death and the choices that are made. The collection is available now in the UK and USA, and as part of The Absolute Sandman, Volume IV (UK, USA). An archaeological expedition is searching for the legendary kingdom of Yamatai, believed to be located in a hazardous, storm-wracked area near Japan. The expedition is shipwrecked on an uncharted island and attacked by hostile other castaways, who seem to be part of a cult following a maddened priest. 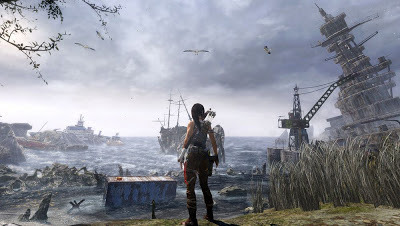 When several members of the expedition are kidnapped it falls to the youngest and most inexperienced member - one Lara Croft - to rise to the challenge, save her friends and find a way of getting off the island. Tomb Raider is a fresh reboot of the series of the same name, discarding the continuity built up over the previous eight games in favour of a fresh take on the premise and the central character of Lara Croft. Croft was very much a child of the 1990s: ballsy, confident, arrogant and a bit cartoonish. Her fresh incarnation is younger, constantly doubting herself and doesn't know how to chamber a round, let alone how to dive around dual-wielding pistols and shooting tigers. This is, much as it pains me to say it, a 'gritty and more realistic take on the character'. Tomb Raider is a curious hybrid of several game types. 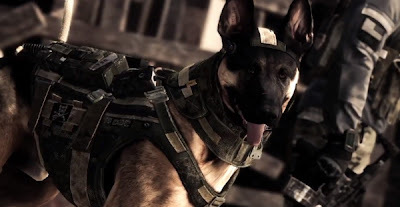 It's a third-person action game with a linear story, but which keeps the map open, allowing you to revisit previous areas to find more resources and new locations, once you have unlocked new equipment later in the game which allows you scale previously-inaccessible cliffs and blast open hitherto-invulnerable blockades. It isn't an open-world game - the island is portrayed as an interlocking series of explorable zones, not a wide-open space like the recent Far Cry 3 - but it throws in enough nods at an open world structure to make for an interesting hybrid. The semi-open-world structure makes for a curious incompatibility with the game's storyline, however, which is almost always urgently demanding you rush to the next objective and complete the next mission. This urgency is diminished when Lara decides to spend 2 hours painstakingly combing a forest for GPS trackers and magic mushrooms. Doing these side-objectives is important as it gives you more experience points which you can use to improve Lara's abilities, and also gives you more salvage to upgrade your weapons and equipment with. Lara is a fairly athletic character, able to scale vertical walls with the help of an improvised pickaxe, jump large distances and shimmy all over the place on rope bridges, some of which you create yourself by using a bow and rope-arrows. The game signposts where you can use these tools - literally by using a special view mode which highlights all usable objects in an area in bright yellow - but it can be fun seeing your destination and working out how to get there using the tools at your disposal. Tomb Raider is at its best when you have control for long periods and are given objectives without being hand-held through the whole thing. This is best exemplified by the optional tombs, which Lara has to explore (or 'raid', if you will) through her own ingenuity. Unfortunately, these tombs tend to revolve around one puzzle each and most of them about about 50 feet across in size, making them more like the 'dungeons' from Skyrim that consist of one winding passage and two rooms than substantial locations in their own right. Still, the idea is good. There is also quite a lot of combat, initially against animals (though, sadly, not tigers) and later on against human opponents. The gaming media has gone rather overboard in praising the scene in which Lara overcomes her first human opponent, kills him and then expresses realistic feelings of shock, panic and revulsion at having to do such a thing. All of this is effective in the moment, but undercut by Lara blowing away hordes of attacking nutcases literally a minute later without any qualms at all. 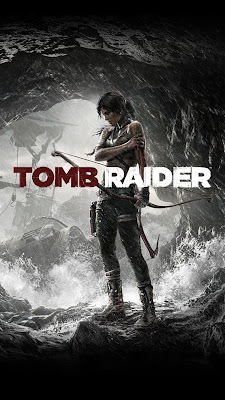 By the endgame, in which Lara has to taken on an entire army of attackers in a temple forecourt spanning multiple levels and featuring tons of explosive barrels you can detonate to obliterate half a dozen foes at a time, this moral disconnect between story and gameplay has become absurd. Entertaining, certainly, but the game's musings on the desensitisation of killing and possible symptoms of PTSD ultimately feel like a sop to critics of videogame violence more than any real desire to explore the issues in depth (something else it shares with Far Cry 3). When the game stops wangsting about this stuff, it's often excellent. The freeform stuff is very good. Unfortunately, the main storyline is corncheese. 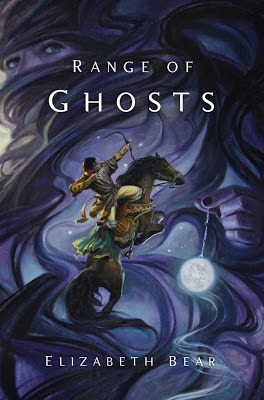 It starts off trying to be grim and gritty and realistic, but by the end it's become an out-and-out fantasy involving undead creatures and spirit beings. Major story beats are transmitted through either cut scenes or particularly tedious Quick Time Events. The game's use of QTEs is obnoxious and over-the-top, taking over from the proper gameplay all too often. So do cut scenes, which are not differentiated from the gameplay either, often with the camera retaining its standard position over Lara's sholder, meaning (particularly in the first hour or so) that sometimes they end and the player has no way of knowing they're back in control until they die. Also, the game's moment of victory is in a cut scene rather than through player agency, which is a completely unfathomable decision. The less said about the supporting cast - Lara's fellow castaways who are only around to get rescued or provide awful dialogue about why Lara's next plan is going to fail despite her last three working fine and saving all their live - the better as well. From a technical standpoint, the graphics are excellent (despite the odd glitch), the controls are smooth, responsive and fully customisable (and you can remap the Enter key, which is awesome and inexplicably rare these days) and overall the game is fun to play. The problems prevent Tomb Raider (***½) from achieving its full potential. The game's curious mixture of Far Cry freeform jungle stuff (including hunting and skinning animals), Prince of Persia style puzzle-solving using the equipment available, enjoyable combat (including one of the best and most natural cover systems I've seen in a game) and tons of bonus objectives all makes for an excellent gaming experience. But that experience is undercut by the game wrestling control away from you all too-often for indifferently-written cut scenes and repetitive Quick Time Events. When the game lets you play it how you want to, rather than how it wants to, it's superb. The game is available now in the UK (PC, PlayStation 3, X-Box 360) and USA (PC, PlayStation 3, X-Box 360).